It's one of the three most historic and seductive old towns along the Dalmatian Coast (the others are Dubrovnik and Hvar). 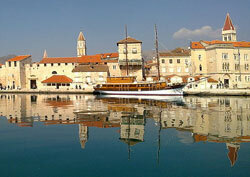 Trogir Old Town is a jewel. It snugly sits on a petite island wedged between the Croatian coast and Ciovo Island. Most of the monumental structures - castles, churches, and more - date back over 500 years. The grand main square, the narrow cobblestone alleys, the sea of reddish-orange tiled roofs, and the yacht-lined harbor add to the appeal. The highlight is Radovan's wonderfully sculpted west portal. The bell tower that dominates the skyline is also laudable. Their bold profiles take us back to medieval times when Trogir was a prosperous and influential Mediterranean trading port. Some vacationers visit Split (27 kilometers or 17 miles away) to see its famous Diocletian Palace, which is also a Hillman Wonder. You can get there in under 30 minutes by road. Trogir has a small fleet of independent sailing yachts that offer multiple-day, live-aboard cruises to other Dalmatian Coast islands. You explore small fishing villages and swim in secluded beach coves.